I've come to the realization that one of the biggest reasons I love sewing is that I love fabric. I LOVE FABRIC! I am always thinking up ways to cover my world in beautiful fabric. I know I'm a little crazy but I can be crazy on my blog right? 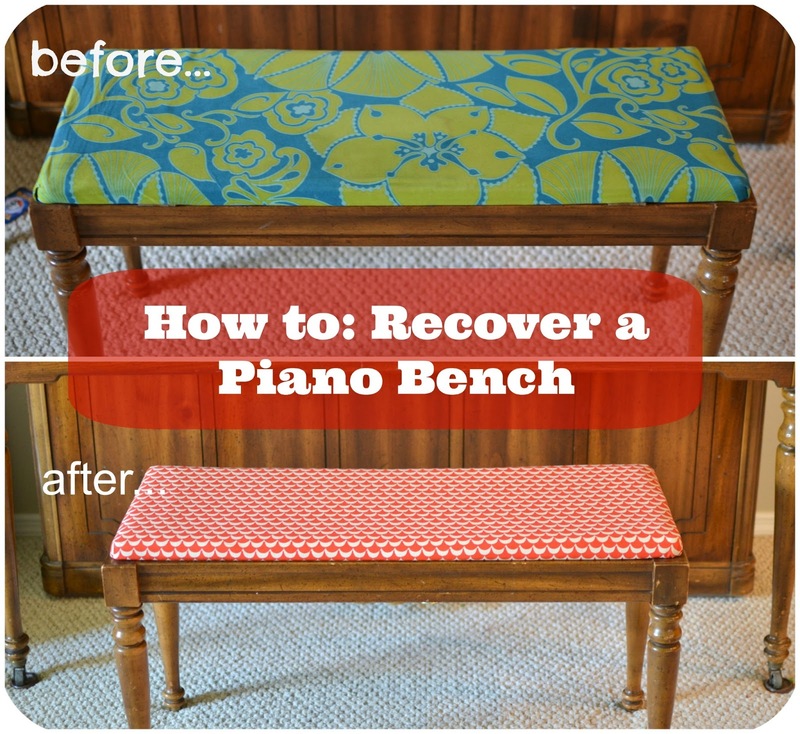 My piano bench is a perfect place to put the fabric I love. It is in the middle of my living room and I get to see it everyday. We recently repainted the inside of our house and now that the walls are pristine, I kind of feel like everything else should be too. Which meant it was time for a piano bench update. I've been eyeing the Ellen Luckett Baker's Stamped Collection since it came out. I thought this was the perfect occasion for buying some. I found this at Stash Modern Fabric. Love that shop! 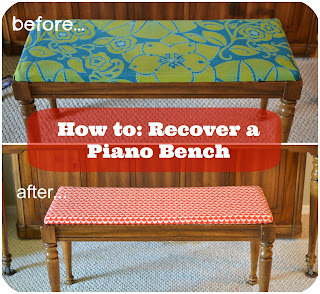 So here's a little "how to" on how I recovered my piano bench. 1. Unscrew the top and removed the old covering. I would leave the original upholstery on unless you are planning on replacing the foam as well. Lay the top down on the fabric an cut around it allowing enough fabric to fold over the edge. Make note of where the screw holes are because you are going to have to be able to find them again later. 2. Start by stapling the center of each side. Pull the fabric tight as you staple. Continue to staple along each side starting at the center and pulling over and out as you go. ... fold the corner up, over, and down. 4. Using a glue gun, glue ribbon on the inside to cover up the raw edge. And screw the top back onto the bench. It might be necessary to poke a small hole in the fabric/ribbon to get the screw in. Now enjoy your lovely new piano bench!! Hooray for a quick summer project!